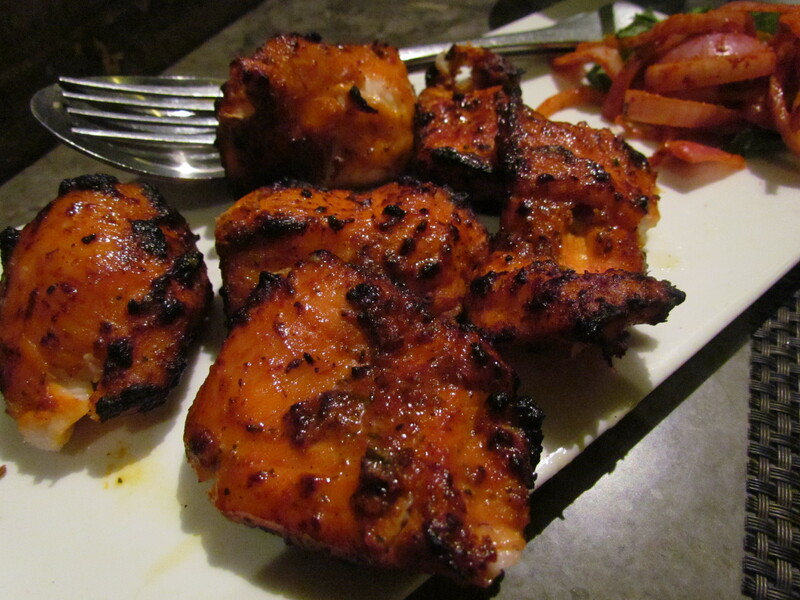 Nice Ambience restaurant serving Pakistani & Northern Indian cuisine, good service & generally good food. Right from the entrance, the ambience was of Music, ghazals , the mood created by this music , lighting and visual design was of shaam sharaab muhabbat ( not the true love kind, but of the nawabi style). Dim light overall enabled by candle light on each table + occasional lights from the side. 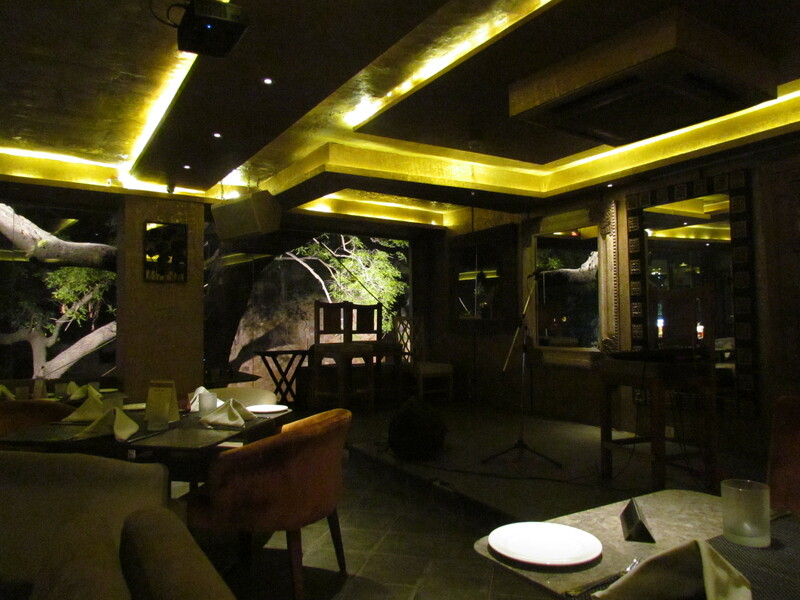 Rustic, unfinished look of walls and ceiling. Later those ghazals made way to Sufi inspired music – the modern versions of Sufi sounding songs with western instruments. There was a Live music bandobast too, with a small stage, mike etc set up. The restaurant is located in haus khas village. One wall of this restaurant is adjacent to the fourteenth century buildings built by Alauddin khilji around the water body ( hauz means water tank / lake and khas means royal – this is a man made lake built in those times for the royal families). 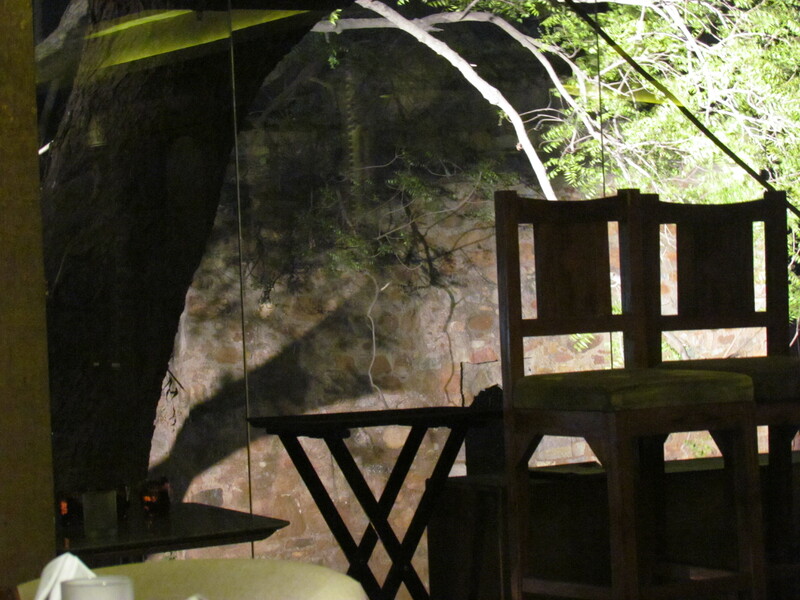 The glass wall makes sure the historic wall is seen while sitting inside the restaurant. Wall of the old building adjacent to restaurant. Furniture consisted of Chairs with table, sofas, combo of stools and sofa around a table – different kind of seatings all around the room. Menu card was simple to understand and had good description in them. There was an electronic feedback form as well at the end if the meal. 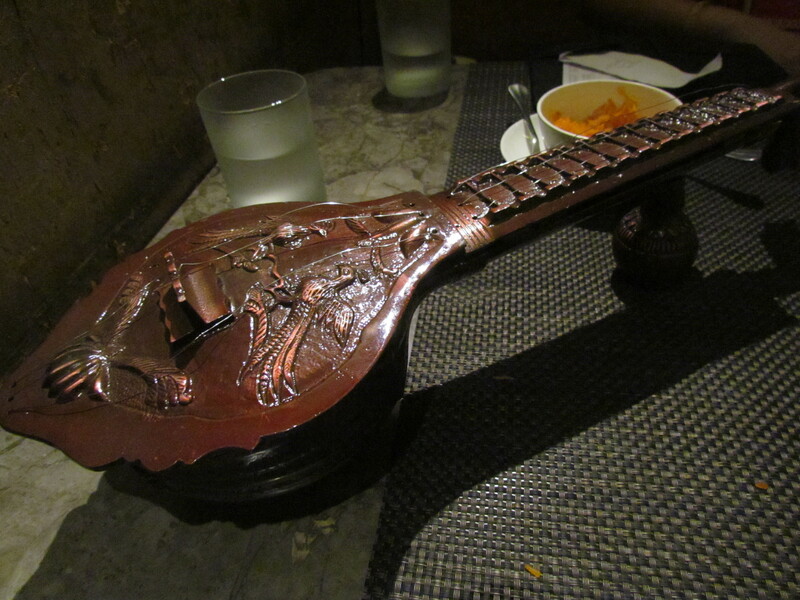 Mouth freshness were served in a metal veena ( traditional Indian musical instrument lookalike. The top layers of the veena wud open up to chambers that held the mouthfreshners. Service was very good. When we went went in, it was early evening and we were the only guests. We got a lot of attention and pampering ( genuine one, without them knowing our identity). The guys were warm and efficient at the same time. 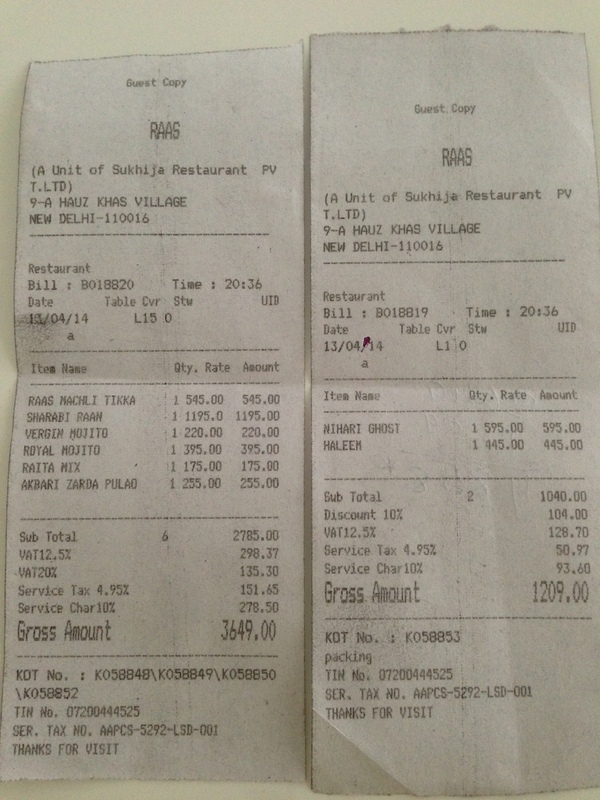 Food was average to very good – I wud say a wide spectrum. As we settled down, we were served 3 chutneys. 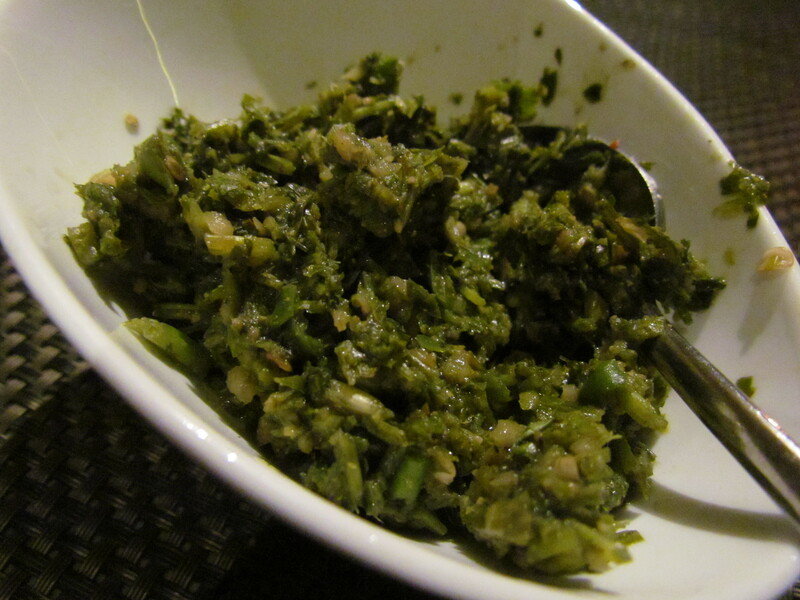 one of them was mint and coriander chutney with green chillies. It had the Perfect seasoning, super chatpata, coarsely ground ingredients not made into a paste like most other places. That made it stand out. Excellent. Rate it 4.5/5. The other two were usual chutneys that were good and deserve a rating of 3/5. 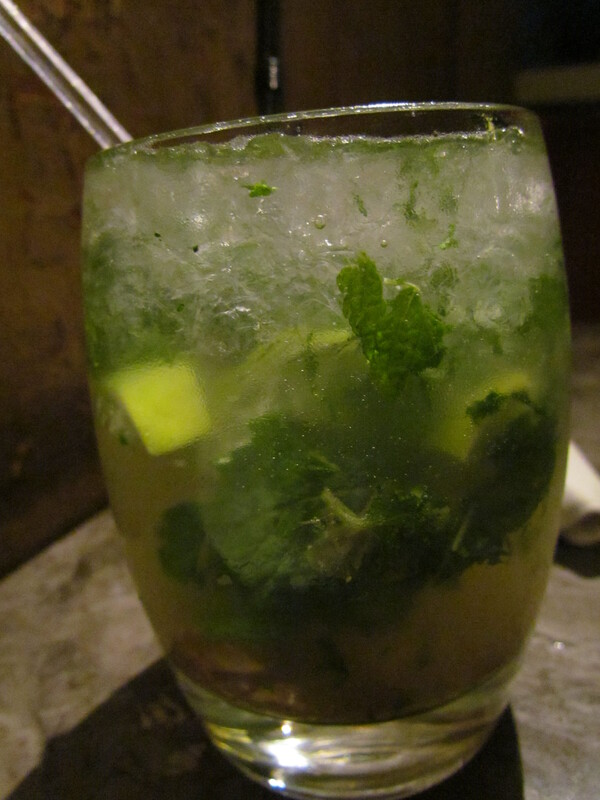 For drink we ordered a unique sounding drink – Paan and gulkand mojito. It was potent, strong, sweet and sour a bit high on sweet side . Gulkand and paan flavor very subtle not on the face but mildly made its presence felt. I wud say it was different and very nice. Rate it 4/5. 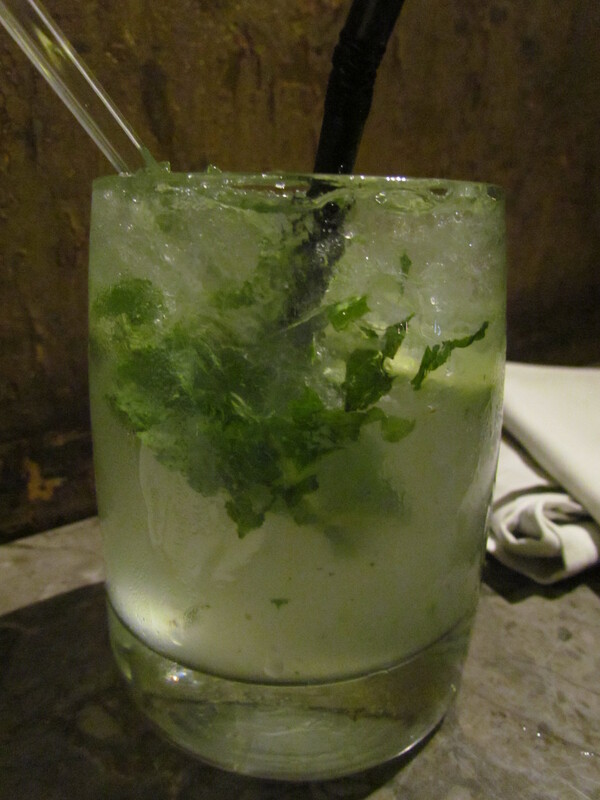 We also ordered a virgin mojito. It turned out to b good. Good proportions of sweet, sour. Flavor of mint. Rate it 3/5. 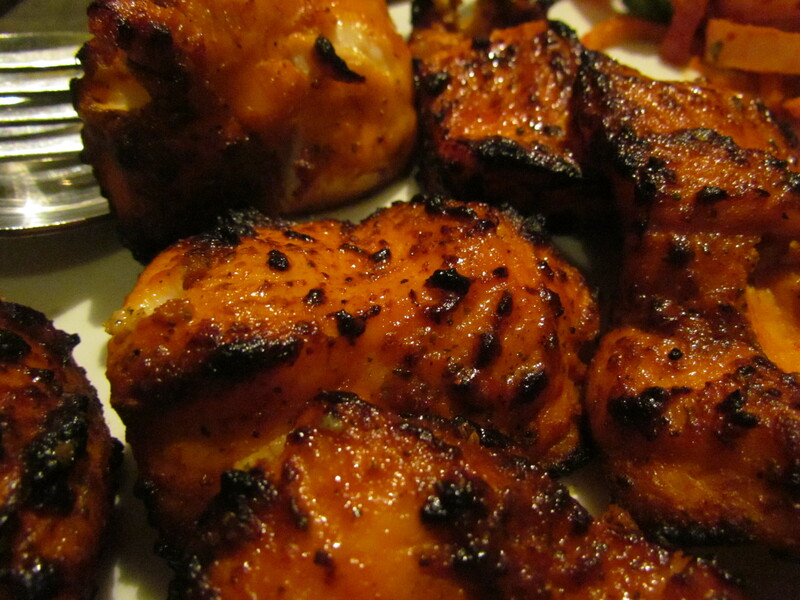 We ordered raas machli tikka – Fish was not juicy but soft, slightly flaky. Excellent spicing transformed an ordinary fish into extraordinary. Ajwain made its flavor felt without being offensive . Charred corners of the fish were thoroughly enjoyable. Seasoning of the dish was perfect. 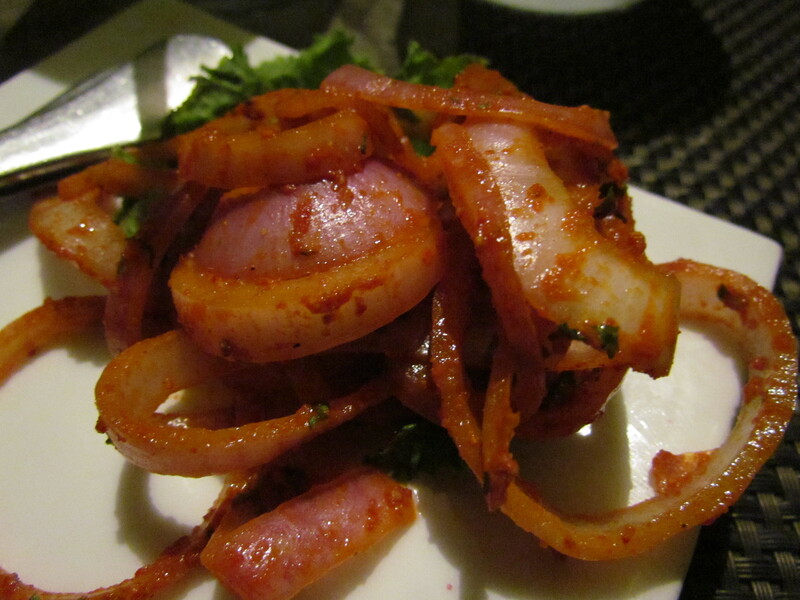 This fish dish cud have been a killer if they wud have used better and more flavorful fish. Rate this 4.25/5. 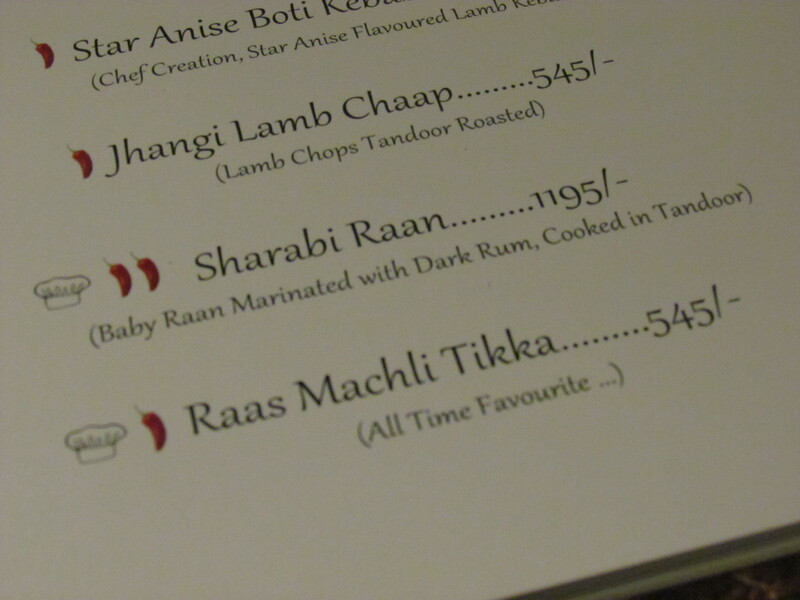 Post the wonderful fish we ordered sharaabi raan – ‘baby raan marinated with dark rum cooked in tandoor’ Said the description. 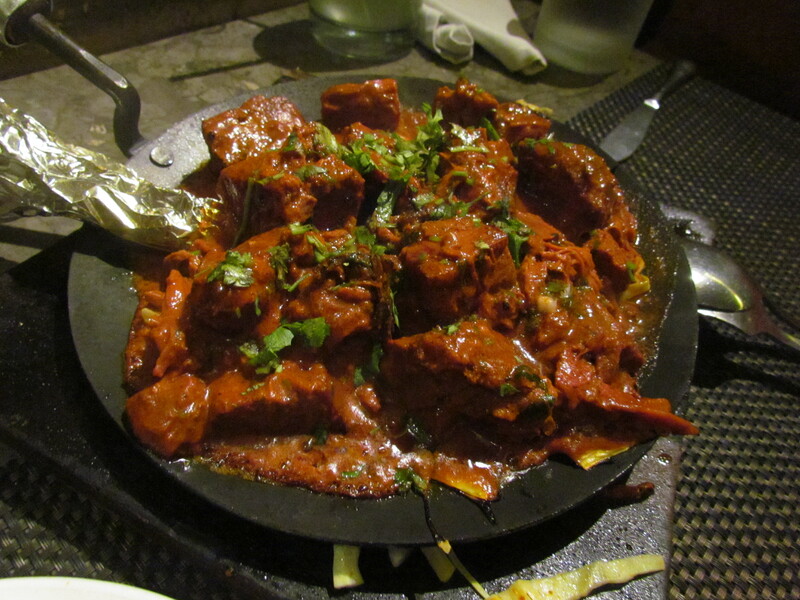 The raan had very soft pieces of meat, the strands of the meat were visible but cud not b felt much while eating. 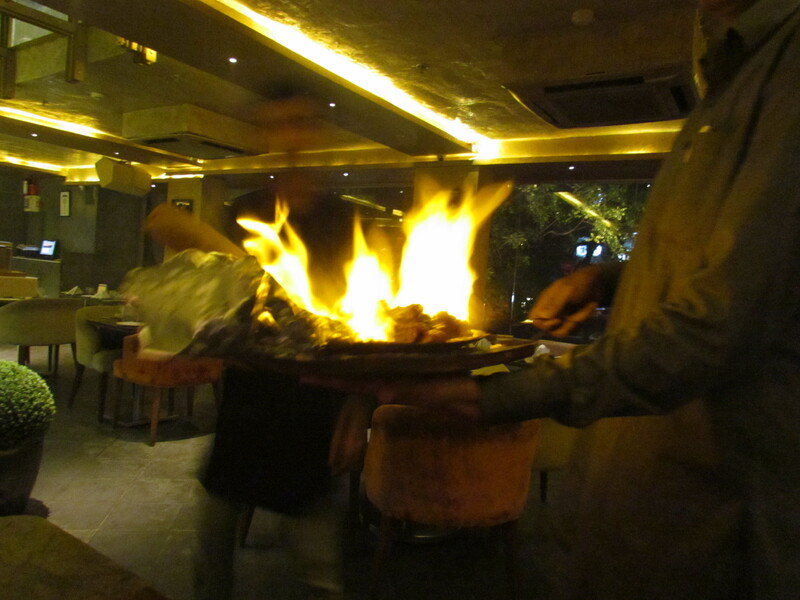 This dish was Flambeed and served. Quite dramatic I must say, with live flame etc. 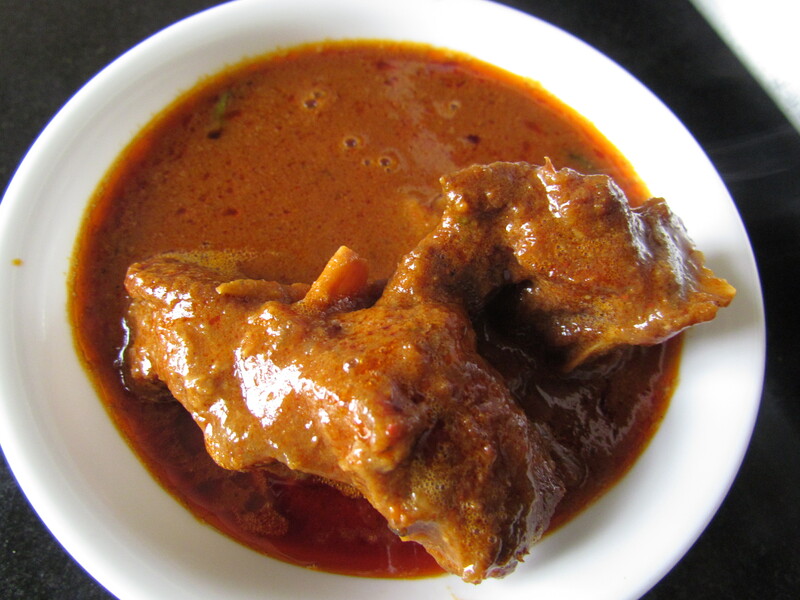 Nihari gosht was really nice. We polished off the gravy till the last drop. The meat was pretty soft and tasty as well. I have had better Niharis but this one was surely good. Loved this dish and rate it 4/5. Haleem was very tasty as well. 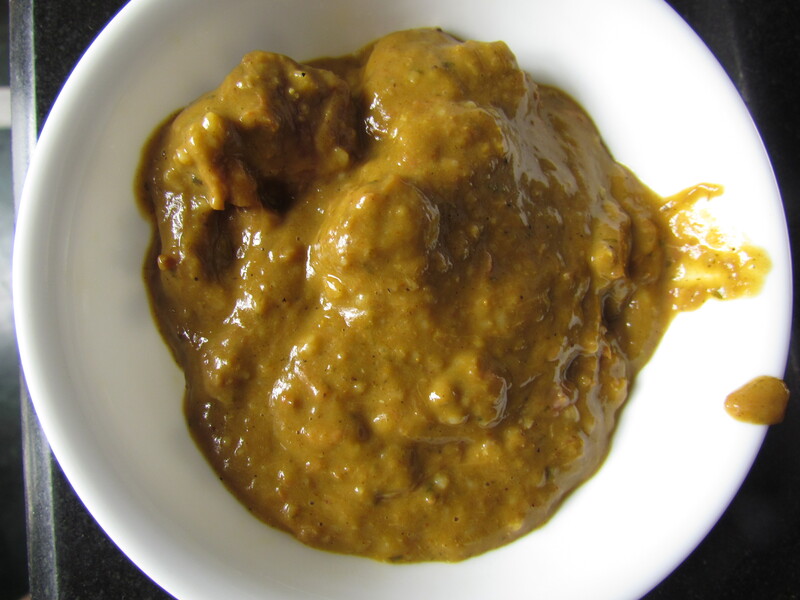 It was not paste- like, the way it is in case if the famous Hyderabad haleem brand – pista house. There were chunks of meat. I guess this haleem was one of the best I have had in months. 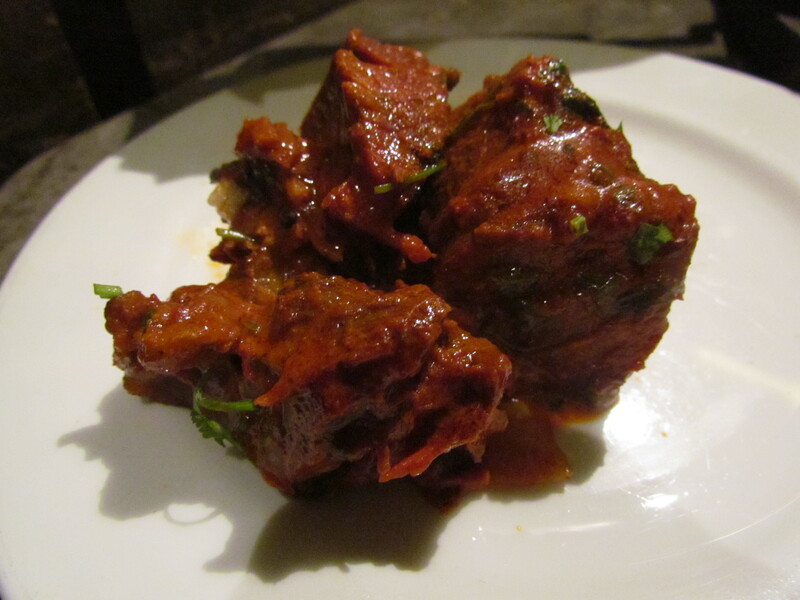 The flavours of spices, the overall taste, the uneven texture, all of those made it really stand out. Rate this dish 4.25/5. 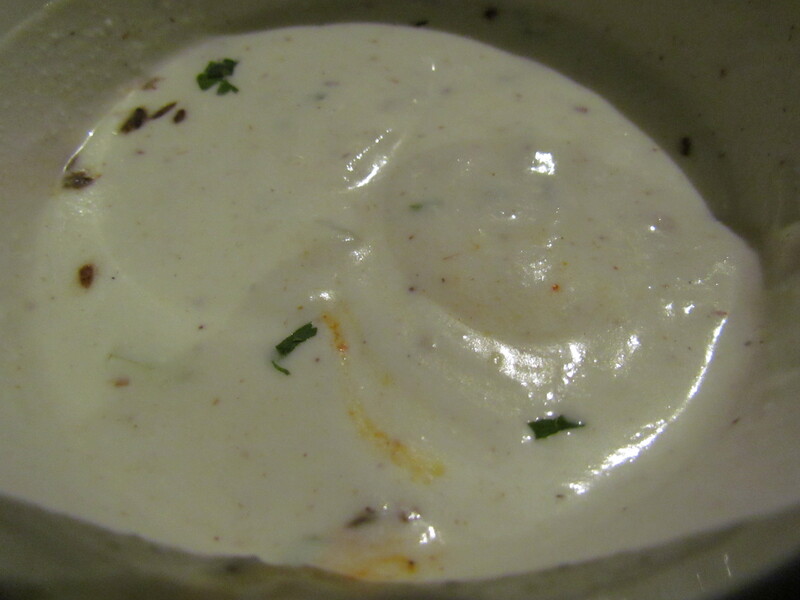 Also ordered a raita mix. 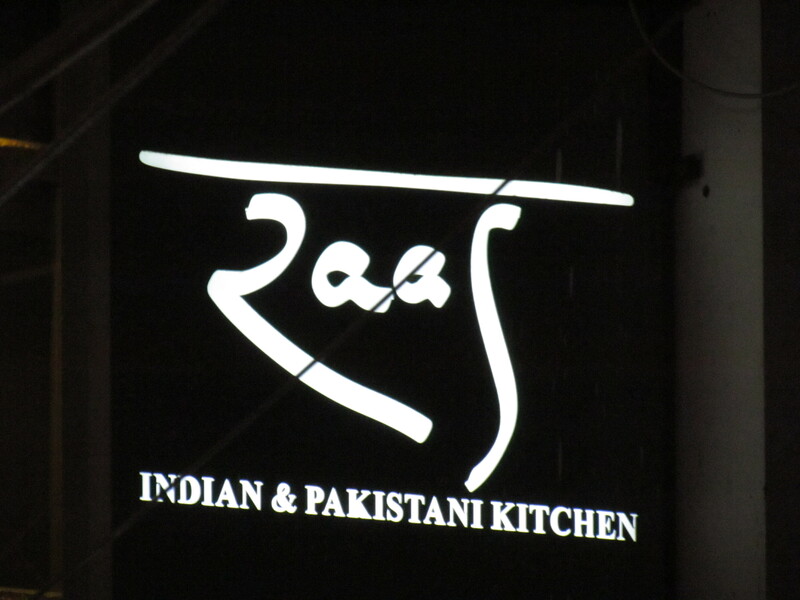 It was very good- as good a raita can get. Good proportion of salt, hint of sweet and chatpata masala. Rate it 4/5. 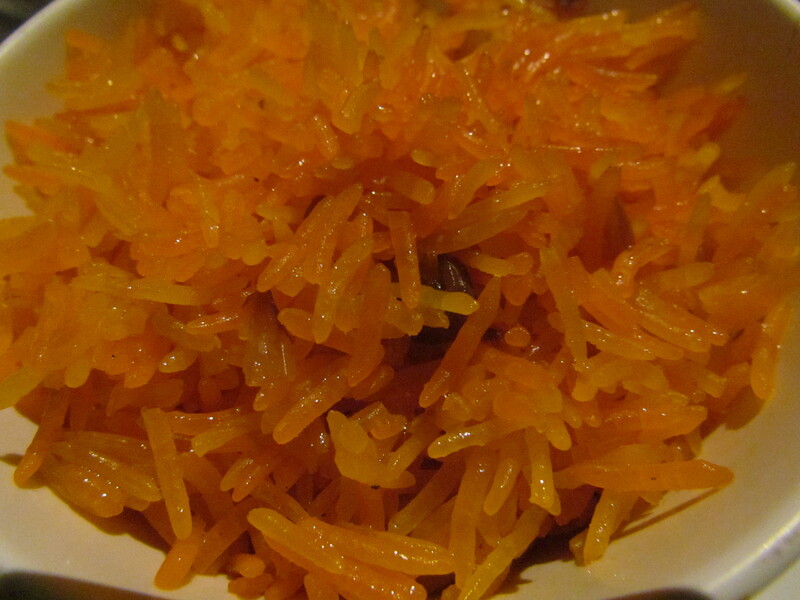 Akbari zarda pulao, also called Zafrani zarda sweet rice with ghee raisins cashew. Unidirectionally sweet, no flavor of zafran. Only color used. Worst was that the rice was not fully cooked – hence rubbery & not soft. It was however independent grains of rice. Try this at a good place and u will know the difference – tharra vs single malt. I rate this dish 1/5. Well, my experience sure wasn’t as great. Glad you had a better time. Sure seems like they’ve improved since the last time I visited them. pls share ur comments in case u remember dishes that were not good etc.